While Creating the Polio Vaccine, Jonas Salk Had to Deal With Critics Like Walter Winchell, Who Warned, "It May Be a Killer"
In 1952, Americans suffered the worst polio epidemic in our nation’s history. As in prior outbreaks, the disease spread during the summer, mainly attacking children who had been exposed to contaminated water at public pools or contaminated objects in other communal places. The poliovirus entered the body through the mouth and multiplied in the gastrointestinal tract. Symptoms started innocently enough—a sore throat, a runny nose. As the virus moved throughout its victims’ bloodstreams, the pains soon began—electric shocks darting through the neck to legs, muscle spasms. Within a day or two, paralysis set in. If the virus made it to the nervous system in the base of the brain, death came quickly. By the outbreak’s end, 58,000 people had been stricken. More than a third were paralyzed, many of whom spent the rest of their lives in a wheelchair or bed. Most Americans today have no concept of the terror generated by polio throughout the first half of the 20th century. During epidemics, newspapers and magazines displayed adorable children struggling to walk in braces or entombed in iron lungs, but the disease mostly fell off the national radar after it was eliminated from the country in 1979. In the past few years, however, polio has begun creeping back into headlines, for two opposite reasons. On the one hand, thanks to the Global Polio Eradication Initiative, the world is closer than ever to wiping out the virus completely; widespread vaccination efforts reduced the number of cases to 414 in 2014, mostly in Pakistan and Afghanistan. On the other hand, because of recent anti-vaccination trends, it’s not unreasonable to worry that a resurgence of polio might afflict Americans again. The person responsible for easing our minds over the past half century was Jonas Salk, a physician-scientist who was born in a New York tenement and driven by a passion to aid mankind. During the 1952 outbreak, with funds from the March of Dimes, he rushed to develop the earliest vaccine for polio that used a killed, or “inactivated,” form of the virus. In that, he met resistance from more-senior scientists who believed that only a vaccine made from a live virus could provide lifelong protection. The public was desperate for a vaccine, yet Salk was afraid these scientists would try to derail his efforts. Objections from one even prompted the famed newscaster Walter Winchell to warn his radio audience not to take the vaccine, because “it may be a killer.” So Salk initially made and tested his vaccine in secret. Thankfully, his promising preliminary results led to the March of Dimes launching the biggest clinical trial in the history of medicine. 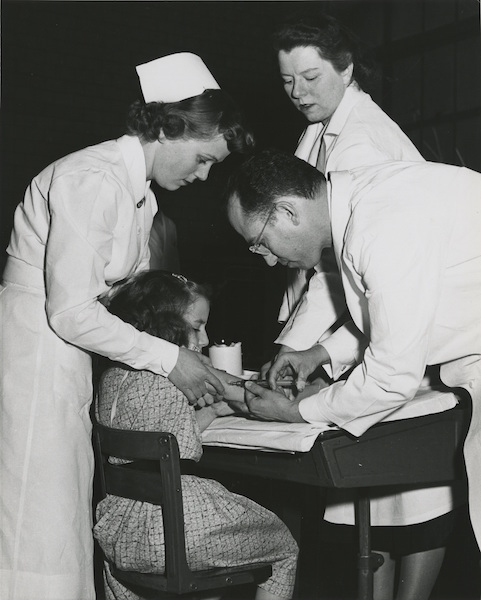 Beginning on April 26, 1954, with a six-year-old named Randy Kerr from McLean, Virginia, the trial eventually involved 1.5 million children, and had remarkable results: Salk’s vaccine was 80 to 90 percent effective in preventing paralytic polio. It was mass-produced and distributed around the country, and by the end of the decade, it had reduced the incidence of paralytic polio in the United States by 90 percent. 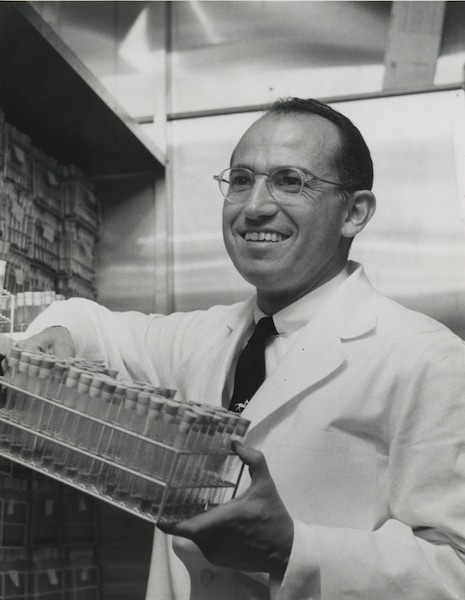 When the success of the vaccine trial was first announced, the public crowned Jonas Salk a national hero. He experienced a celebrity accorded few scientists in the history of medicine. Yet his rebuke by the scientific community had only just begun. As heads of states around the world rushed to honor him, scientists—the one group whose adulation he craved—remained ominously silent. Basil O’Connor, director of the National Foundation for Infantile Paralysis/March of Dimes, said they acted as if Salk had committed a felony. They accused Salk of failing to give proper credit to other researchers whose work had laid the foundation for his own. Salk in fact had tried to give them credit. But the media had made him the icon for polio, ignoring other scientists’ contributions. This set the stage for difficulties throughout Salk’s career wherein politics in and beyond the scientific community seemed to override good science. Jonas Salk in his laboratory, 1954. Salk also campaigned vigorously for mandatory vaccination, putting the health of the public foremost. He went as far as calling the immunization of all the world’s children a “moral commitment.” Thanks to his efforts—along with those of other researchers—we’re able to enjoy our summers without the fear of a crippling disease. America now has been polio free for more than 35 years, and children are supposed to be vaccinated when they are babies. We’ve reached the point, however, where it seems many people can’t believe an epidemic could really occur. Some parents refuse vaccination, arguing that a healthy lifestyle is enough to protect their children from potentially lethal infections. But studies have shown that the introduction of sanitation actually enhances the circulation of poliovirus, because babies are no longer exposed to the virus in the very small amounts that used to produce lifelong immunity. Poliovirus can spread relentlessly once it gets a foothold in an unvaccinated community. Such was the case shortly after Salk’s vaccine was released in 1955. Massachusetts closed its vaccination program because a manufacturing error led to some contaminated shots. Even though the mishap was quickly corrected, the state did not reopen its program. That summer, Massachusetts suffered one of its largest epidemics. Four thousand people contracted polio, and 1,700 were paralyzed—mostly children. Does the public want to repeat history? I think Jonas Salk would plead with them to learn lessons from our past. Californians did with the recent measles outbreak, which affected more than 130 people, the majority of whom were unvaccinated. This helped spur the state to join Mississippi and West Virginia by mandating childhood vaccination, despite an outcry from several groups. Now if only 47 other states would follow suit. Charlotte DeCroes Jacobs is a professor emerita at the Stanford University School of Medicine and the author of Jonas Salk: A Life. 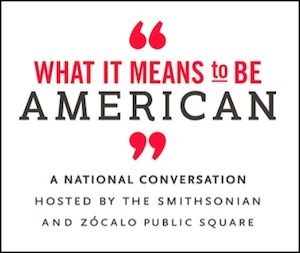 She wrote this for What It Means to Be American a national conversation hosted by the Smithsonian and Zócalo Public Square. *Photos courtesy of Jonas Salk Papers, Special Collections and Archives, UC San Diego.